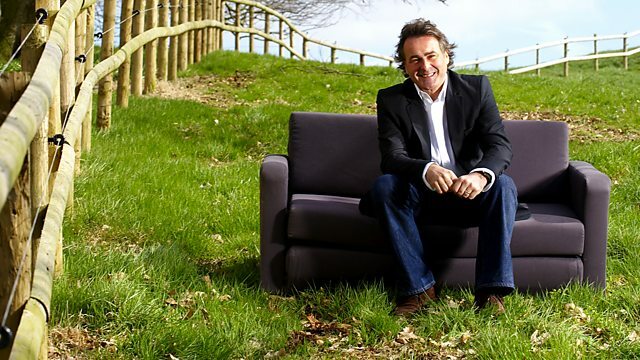 St Austell ‹ Series 4 ‹ Flog It! Paul Martin goes back to Cornwall, where he grew up, to value collectibles brought along by the people of St Austell. Paul also meets local artist Graham Ovenden. Browse content similar to St Austell. Check below for episodes and series from the same categories and more! Today is home sweet home for me because I grew up here in Cornwall. you're never too far away from the rugged coastline with its sweeping bays and pretty fishing villages. Today we are in St Austell. because it's a special place. and I wonder what we'll find in this massive queue. but all this stage atmosphere has gone to our experts' heads. and Kate Alcock who has changed her identity - you've just got married. -I have, so now I'm Kate Bliss. -That sounds like a stage name! Congratulations. -You go that way, I go that way. While everyone's unpacking their treasures, Kate wastes no time in finding her first little gem. This is an interesting figurine. What's its history? and it's been on the side ever since, different places. We saw you were going to be here today, so we thought we'd bring it and see what you thought of it. This stands in a tradition of chryselephantine figurines. of bronze, of course, but also of ivory. -the subject is very different. and it reminds me of Christopher Robin, the AA Milne character. -It's obviously a child and he's dressed in his oilskin. He's got that charming pose as if he's striding out against the elements. On the back we have a signature, "Campbel", spelt with one L.
with a striking subject matter. This would be considered quite paltry in comparison. So artists often used pseudonyms, so they're weren't underselling themselves. to give it that really nice toffee brown colour. It just looks as if it's been lovingly handled and worn which sets it off really nicely. It's very saleable. Have you any ideas about value? -Well, we hadn't really, not when we first came here. -Well, I had hoped round about 200, something like that. That would be a fair estimate, £200 to £300 at auction. -not that I know what such a chap looks like! -and thought it was a lovely doll. -You've got an eye for the dolls? Not really, but I just thought it was cute, interesting. -So when did you buy it? -A year and a half ago at an auction in Redruth. -You paid £130 for a doll that just took your fancy? Somebody else was bidding on it, so it must be worth something, I thought. But you tell me. Let's look at the little chap. He's unusual because he is a boy doll. You see girl dolls all the time. He's not a large size. But he's got a lovely face, a cute face. He's got fixed eyes. His complexion and condition are good. He doesn't look terribly old, but he's got this marvellous outfit. He looks like a character from Oliver Twist. So he's a very appealing little chap. I'll just take his cap off. -He's more baby-like now. He doesn't look so grown-up. Let's turn him over and look at the back. It says, "Made in Germany." -That's an ink stamp mark. it would have had an impressed mark impressed into the china head. You also mentioned that you'd put it on eBay. -It was sold for £250. -But in the photo, the mould mark looked like a crack in the head and she withdrew from buying it. -Which was the mould mark that she saw? -Around the neck, that line. And around its ear here. Anyone interested in collecting dolls should have known that what's they were, but obviously not. because I don't think he's worth much more than £200, if that much. The amount you paid for it was the going rate. -that would be a good estimate and a reserve at 140. Let's see if he'll raise a few bids in the auction. Annie's brought an unusual drinking vessel, but Kate's seen a problem. -cos we have got a very bad crack down the side, haven't we? We've got some chips on the top and a very bad patch of staining. But for me, it's still a very exciting mug. -at Bisham Abbey in Buckinghamshire. -When it was really an abbey? When my father and mother left, my father was given this mug. -And you think that this mug came from the abbey? -And what do you like about it? -I just love the creamy colour. -I just love the beauty of it really. -It's a really rich colour. because of its lovely, rich cream glaze and colour. so we're talking a long time ago. -No wonder it's been through the wars! whereas a lot of pieces in the 18th century were Chinese-inspired. whereas this looks like a little English cottage. It's only the trellis fence which is a throwback to the Chinese decoration. It's difficult to pinpoint an exact factory. A lot was made in the Leeds potteries. This possibly could be Staffordshire. -I think it's a cider mug. You could put an awful lot of cider in there. -Why do you want to get rid of it? -I'm reluctant to get rid of it because it's very special. -But I've got too many things. The condition will make a difference, but collectors will go for this. It's a nice bit of Creamware, a good sized piece. but we could put a reserve, if you like, at 250. Ken, when I saw this in the queue, I thought, "It's Georg Jensen!" I was told it was a drinking bowl, but I don't know. It's modelled on an early Georgian posset pot. couldn't hold a drinking vessel properly, so they used two hands. It's not Georg Jensen, but it is pretty damn rare. I want you to tell me where you got it from and what you know about it. I got it from my wife's parents. It was a hand-down. and I thought I'd bring it along today and see what it is. It's very stylised, very evocative of the Arts and Crafts movement. which is a natural stone. They said it was morally reprehensible to facet their stones for the Arts and Crafts movement. It's stamped "Guild of Handicrafts, CR Ashby". Here we've got some assay marks. There's the lion passant which says it's Sterling Silver. The leopard's head tells us it's London and that stylised "G" tells me it's 1902. -Yes, that correlates with the Guild of Craftsmen. I'm not an expert on these, but I do love this type of thing. It's a gorgeous piece of workmanship. It's an innovative industrial design for its day. There's a bit of damage. Did you do that? -No, it was like that when we received it. -It can be sorted out. It's two little dents - one there and there. -OK, value, what do you think it's worth? On a good day with two people fighting for it, hopefully £1,500. But on an average day, £800 to £1,200. -Do you want to sell it? Joy, you've brought in this nice watch and chain. Tell me about it. -He gave it to you how long ago? When he died 20 years ago, and it's been passed down. -There's something special about this watch. -It tells the quarter of an hour. It's a quarter repeater pocket watch. I'll do it now. Just listen. -One, two, three. One, two, three. ping, ping, ping, and three-quarters - da-dum, da-dum, da-dum. -and you knew what time it was to the quarter of an hour. -So, quite an ingenious thing. It's in a nice, plain case, so it hasn't been personalised. so that's what the chimes told us. -with import marks for London 1920. Let's have a look at the movement. then you've got these two metal bars around the outside. and it sounds like a bell, so we'll do it one more time. That's the special thing about this watch and it's in very good order. -I think this is going to make over £400. -I think it should make maybe £500. I think if we put an estimate of £400 to £600 as a wide estimate with the reserve at £400? -We won't sell it for less than 400. We're about halfway through our day and our experts have been working flat-out. It's time to put those valuations to the test at the auction room. Here's a recap of the things we're taking with us. and she thinks it will sell well. Boy dolls are rare, but will that push up the price in the saleroom? but let's hope the quality shines through. I love the craftsmanship of this drinking vessel. It's sure to catch someone's eye. so fingers crossed on our items. to Lostwithiel on the River Fowey. It's a thriving centre for antiques and this is home for our auction today. We're at Jefferys Saleroom where I catch up with Ian Morris to see what he thinks of our antiques. This Staffs mug belongs to Annie. She got very emotional because she's got to say goodbye to it. Our expert Kate valued this at £250 to £350, lovely bit of Creamware. Oscar Wilde said, "Drinking is a mug's game. The bigger the mug, the better." It's a cracking sized mug and it's a lovely decorated mug. and a crack through the middle of the body. This might stop it selling. So 250 to 350 is a good valuation for one in perfect condition? -In perfect condition, that would be cheap. -What would a perfect one go for? -Well, fingers crossed on this one. First to go under the hammer is John and Pat's figurine. Kate and I have been joined by John and Pat. That lovely bronze figure is about to go under the hammer. -You got this in a junk shop in London? -Not a lot in them days. -£10 or something like that? He's got a Christopher Robin pose. -Fingers crossed. It's going under the hammer now. Good luck. Bronze and ivory figure there, depicting a boy in a sou'wester. I've got two bids at £300 and that's where I'll start. £300. 320. At 320, the bid's at the back. 340 now? Both my bids are out. Short and sweet, straight in at 300, sold for 320. I'll thank my dad for that. He was on the phone. No, it's a joke! Let's see if we can get Charlie his money back. -He bought this doll in Redruth for 130 quid? We've got a valuation of £140, maybe £180 on this. It's quite unusual because it's a bisque head doll, but it's of a boy, not a girl. -Hopefully, the collectors will clamber after this. -Let's hope so. I'm no expert on dolls. but we think it's worth this sort of money. Lot 361, doll figure there. £150 away? £100 to start me? £100? £80 I'm bid. At £80. I'll take 90 now. At £80. At 90. 100. 110. At £110 I'm bid. I'll take 120 to get on. At £110 I'm bid. 120 on the phone. At 120. 130. At 130. Is it 140...? 140. At 140. At 140. 150 now? At 140, the bid's on the phone. Are we done at £140? This is one of my favourite lots that we've sold on Flog It. CR Ashby, Guild of Handicrafts. I put £800 to £1,200 on this. -The money is going towards your bathroom, isn't it? We're redesigning it and it'll all help towards it. Very nicely designed drinking bowl. Shall we say £800 away? £500 to start? £500 I'm bid. At £500. I'll take 20 to get on. At 500. 520. 550 now? 1,000. 1,000 in the middle there. At 1,000. Is it 50 now? At 1,000. Are we done at 1,000...? -I was a bit worried that it might just sell for 800. I've been joined by Annie and Kate. We're about to flog the lovely mug. The big one! £250 to £350 we've got on this. and he thinks it might not sell. -Annie told me she'd be delighted if it doesn't sell, so we can't lose, can we? Why were you tempted to flog it? I've got so much stuff. Everyone says the same thing. -Well, Annie from Truro, good luck. I hope you get the top end. This is an 18th century Creamware tankard with blue glaze decoration. A crack to the bottom and chips to the rim, but it can be restored. Can I say 250 away? Can I say £200 away? £200 I've got. At £200. I'll take 210. -Yeah, we've done it. It's sold. At 280, the bid's with me. 290? -£280. You don't know whether to be happy or sad. I'm torn really, but my dad would be happy, he'd be thrilled. Joy's feeling ecstatic. Her lot's going under the hammer. -Lovely quarter repeater pocket watch valued at 400 to 600. -It was Dad's, but it's been in a drawer. -Let's hope we get the top end. -Let's ask the man in charge. -£400 to £600, I think that's good. Time's ticking away and it's up! It's a nine-carat gold case, pocket watch with white enamel dial. It's got a nice chiming movement. I have two bids. I'll start at £400. At £400, the bid's with me. £400. 420. 520, the bid's right there. At 520. 720. 720 to my left. -720, the hammer went down. -Wonderful. I can't believe it. -£400 to £600, good estimate, and 720, couldn't be better. Everyone's happy. It's a Joy moment! OK, don't be that melodramatic. It's not that kind of Gothic. several bygone ages, owned by artist Graham Ovenden. to create another work of art - his house. He took inspiration from the high art of the Victorian Gothic revival and built his house himself. I can't believe it. How long has it taken? There's another 30 years to go, but my son has taken over now. I've become old and fatter. -So it's basically one big DIY job? A lot of the best buildings ever built are DIY jobs, aren't they? You sum up the true Arts and Crafts ethos. If you're gonna do it, do it yourself with your own hands. -I admire the William Morrises and the Pugins immensely because they were immensely capable. he went out and dyed his own threads and wove his first tapestry. So he understood the nature of the beast. I like this. It's very abstract. Is that symbolic of something? My father was an aeronautical engineer and I love the idea of flight. Here we have a crossbow. -And two crossbow bolts either side. That's one way of looking at it, but they could be abstract flowers. -so we have a black star. -Like a black hole of infinity. or it can be enclosing, a prison almost. -It sums up the 20th century. We have greater freedoms, but we made ourselves total slaves in the process. I like the sound of the water, the energy that creates. Oh, yes. When the wind blows as well, the leaves pick up the sound and echo it. -It's a great symphony of wonderful natural sounds. in terms of the philosophy behind their design. I'm talking about high Victorian design, not curly Victorian. Let's go inside and have a look at some more. and examples of their exquisite decorative detail can be seen in every corner. Outside in the garden, you mentioned some of your influences, the Puginesque things. What other influences are there? which has intrigued and delighted me all my adult life. Now, this is the Grammar Of Ornament by Owen Jones. in this country by the middle 1860s and also in France and Germany, Europe in general. and covering across all stratas of architectural ornamentation. Lovely geometric patterns. They're totally different, but still work. This is partly Owen Jones' genius. The whole page is wonderful. there's not a bum page anywhere in it. It's quite remarkable. Here's a particularly beautiful page. This is slightly more home-grown in terms of culture, which is the Celtic. the great masterpieces of illumination. -You see these templates being used on many fine buildings and works of art. and you've got something of Christopher Dresser's here. and his Studies In Design, the book we're looking at, is really his masterpiece. and the structure of nature. "before one can do good ornamentation." as a major art form and it's not subservient to the fine arts, to painting. This is pure Dresser. Notice the use of colour, which is remarkable. which remain quite harmonic within the process. and it's based on ice crystals on a window. Looking into this, you realise the 19th century is the great storehouse of advanced thought in design. and high Victorian design is incredibly exciting. Dresser worked obviously on metals, on canvas, in fabric. Where would he have used this design? This would have been to decorate and, in fact, Dresser tells us. -What does it read there? that goes into the creation, but the modesty of the use of it. Graham, thank you very much. about some artistic decoration on a piece of Moorcroft. This is a very smart-looking vase. What do you know about it? -and it's been handed down by my mother. -Do you know the factory? Yes, it's come from the Moorcroft factory. It's a Pomegranate design. -You know all about it. -I did a bit of research. has very much gone up in value over the last few years. -and it's still very buoyant in price. It's semi-baluster in shape with this lovely flared rim, a shape used a lot by the factory. and used quite a lot. is it is a piece of art pottery and it's got the Moorcroft stamp. that he brought these art forms with trailing slip decoration which you can feel here. -And these very naturalistic patterns and shapes. Perhaps between £200 and £300 possibly. Right. What do you base that on? You're probably bang on with price. I would say 200 to 300 at auction. but not much more than 300.
but 300 is probably its limit as it's a fairly common pattern. Mike, now, books come in all sorts of shapes and sizes. This is a fairly impressive book. It's big and quite old. And you're a bit of an authority on this. I don't know about that, but it's a wonderful book. It's a one-off, it's a first edition. about building the Eddystone Lighthouse in Plymouth. -Smeaton was the architect, the engineer and the builder? -12 miles off the port of Plymouth. And it's the first rock lighthouse in Europe. a revolutionary design which became the blueprint of all lighthouses. except these names and it says, "Smeaton's Account of Eddystone Lighthouse." What are these names? This edition was owned by Darwin's father, so it was the library of Darwin. Certain gentlemen were allowed to use it and these are their names. How do you know this was Darwin's copy? -My friend gave me the book, Robert Lenkiewicz. -He was a painter in Plymouth. he bought this for me and he told me he knew it was Darwin's father's. It's magnificent. Why are you thinking of selling it? It's basically too good for me. It needs to have a proper home. I've enjoyed it, but, as Robert would say, we only loan things. We don't keep them for ever. If I can sell this, I'd like to buy a painting of Robert's. I'm gonna let you do the turning of the pages. How old is this book? -And look at that fantastic image there! The Eddystone Lighthouse was rebuilt on several occasions. We had Henry Winstanley, John Rudyerd, John Smeaton and James Douglass. The James Douglass is still out there. -Smeaton's tower is on the Plymouth Hoe. -We can see it today? And that's the outside of Smeaton's tower. And this is the interior. This shows a cross-section of the lighthouse and the compartments? and where the keepers lived. They were out on a rock for six months and that's where they stayed. and my feeling is that it ought to be worth perhaps £1,500. Would you like to put it into auction with a £1,500 reserve? As long as it wasn't less than 1,500. Firm reserve £1,500, estimate 1,500 to 1,800. -Let's see what washes in. -What have you brought for us today? -I've brought this little box. It's a clinometer with all the instructions. but I have seen one of these before and it is a clinometer. What is it used for? I imagine it's used for gauging heights and levels. "The clinometer - its description and uses. "of objects at a known distance from the observer." It looks rather like a surveyor's tool. and then we have sights on the top here which flip open. In fact, you can measure the angle off the little dial here. That helps you calculate the height. but we also have a little compass which swivels, so you can keep it horizontal. -It's very neat, isn't it? but the thing that really caught my eye was the maker's name in the centre of the compass. Negretti and Zambra were specialists in making barometers. it pushes the price up because it is a sign of very good quality. That's what we've got here. The workmanship is quite superb. -So where did it come from? -What business was he in? -but whether he used it, I don't know. -It looks like it hasn't been used at all. I'd say 100 to 150 at auction with a reserve of just below 100. It's a treat to see it today and I hope we get you a good price. Gina, Steve, you've brought in a pretty little gem of a vase. I think it's gorgeous. What do you know about it? We bought it ten years ago from a car boot sale in Leeds for 20p. -Which one of you has got the eye? -I bought it because it was pretty. -We didn't know if it was worth anything. -So do you own it? What have you found out about it? We recently moved house and I was given an antiques book. I saw a picture that was similar. -What was similar about it? -It was the identical shape and size. It said it might belong to the Tiffany family. The person who really made this style of work famous was Tiffany. And he was subsequently copied by Loetz and a number of other makers. When you look at this vase, do you know when they were made? -Yeah, absolutely right, early 20th century. You can tell this from the Art Nouveau styling you've got here. you can see this iridescence on the surface. of these pieces of art glass. -what does it say on the base? I have not come across this particular name on the base of a piece of glass like this. Now, the word "aur", A-U-R, possibly for "gold". You know, the gold colours. made in the 1920s period, maybe the 1930s period, in the Tiffany style. If that's the case, it's probably worth £200 to £250. -It's worth giving a go for that. -I wouldn't sell it for less. -I think 20p up to £200 isn't bad, is it? then its value could be £300 or £400. and he's got his own original take on landscape painting too. pursuing a romantic dream to find inspiration from an unspoilt time. Graham and Ann Arnold and Graham and Annie Ovenden. where they could draw all their inspiration from the world that surrounded them. Graham, how important is it to your work to be surrounded by such rural beauty? the environment is pretty seminal. The British Isles has some of the most varied and most beautiful landscape in the world. nature has meant an immense amount to us. Graham, can I interrupt you there? -You spent time in the city and started out taking photographs of the streets of London. How did you make that quantum leap to painting landscapes and when? by which time I was a serious painter as well. of those great long parallels of terraced streets is not so dissimilar to the country. You still deal with light and shade and the mystery of dark corners. You've got a lot more imagination than I have! the techniques and structure of painting and of photography are not dissimilar. and the very nature of photography is the use of light. Exactly. Talk me through some of your technique. It looks so air-brushed, if you don't mind me saying! I've never used an air brush ever! and I suppose I use a very traditional process of using semi-transparent glazes. the result being you can build up levels of luminosity and that's the crucial part for me. It's following the structure of nature which is layer upon layer upon layer. It sounds very labour-intense. How long will this painting take? but I would seldom paint a landscape painting inside six to eight months. And quite often on the larger paintings, I'll work on them for three or four years. -But I often paint six or seven paintings together. Otherwise I really would be in the gutters with my begging bowl. I'm a professional painter and that's how I earn my keep, you see. One can't be sentimental about it. One has to work to live. as opposed to going it alone? and it has to all artists, whatever their discipline, since the beginning of time. To have that sort of moral support is obviously a huge bonus. And remember, perhaps being at the sharp end of art, it's not the easiest world to exist in. -People are terribly unkind, particularly the people who write about art. to those of us who can physically do, rather than just talk about it. I write books as well, so I do a bit of both. Well, that's certainly given me lots of inspiration in keeping my dreams alive. Thanks a lot to Graham for that. From the embrace of nature, over to the hustle and bustle of the saleroom. Here's a reminder of our items. and Kate thinks Martin's vase will tempt the dealers. Len's clinometer should definitely be helped by its famous name. And last, but not least, it's Gina and Steve's tiny vase. But is it or isn't it Tiffany? Now it's the magic of Moorcroft. We're always saying invest in antiques with good makers' names. This lot belongs to Martin. It's a lovely Moorcroft vase. Kate's put £200 to £300 on this. Why do you want to flog it? The computer at home did a nasty crash, so I need to replace it. -You need a new hard drive. so this early example will shine and collectors will go for that. -We've got a packed saleroom. It's going under the hammer now. Good luck. decorated pomegranates on deep blue ground. Can I say 250 away? £200 away? 150 I'm bid. 200. At £200. 210. 220. 270 there. 280 behind. 290. 300? 300. My wife will be pleased. Over 300 now! 320 at the front here. 340. 340 in the third row. -A bit of change for you to treat the wife with. -Thank you. Good result, Kate. For me, this is the big one. I went up Smeaton Tower two years ago. who's looking for £1,500 to £1,800. It has a lot of content and history and the condition is fantastic. -Jethro was enthralled when you saw that. -It's a wonderful piece of history. -We're in the right place, we're not far from Plymouth. Let's let the bidders of Lostwithiel decide for us. -Hopefully, there's a few phone bids from London and the big collectors. Can I say £1,500? Can I say £1,000 to start? -£1,000 I've got. At £1,000. I'll take 1,100 to get on. At £1,000. At £1,200. 13 now? At £1,200. 13, no? We're done at £1,200. -Not the right day for that. Get it in an auction room in Plymouth or a specialist maritime sale somewhere in London. and one of my researchers said it measures the angle of the dangle! -My grandfather passed it to my father who passed it to me. so I might as well try and sell it. You've got the memories, now you want to flog it. Let's see if we can get £150, Kate. Well, it's a really finely crafted tool. You've heard it from Kate. Let's try and flog it. The rule, compass and two levels, all in a nice case, lot 458. Can I say £80 away? £50 away? £50 I'm bid. I'll take 5 to get on. At £50 I'm bid. 55. At 60. And 5. 70. At £85 at the front. At 90. And 5. 100. 190. 190 on the cabinet. At 190. At 190. 200 or not? -That's the figures we wanted. Well done, Len. What are you gonna put £190 towards? -Pay my parking fee out in the street, I think! There's not a lot of parking here. Right now we'll hopefully turn 20p into £250. That's the theory on Flog It for Gina and Steve. you bought for 20p in a car boot in Leeds. What were you doing there? We lived there and we went to the car boot on the Sunday for a look round and Gina saw this. -So you zoomed in on that? -I just thought it was very pretty. Will we do it, Jethro? You've put a valuation of £200 to £250 on this. I didn't know anything about that name "Aurene" underneath. -Have you ever heard of it? invented this particular technique in the early part of the 20th century, around 1910. -so 200-ish is what we're aiming for. It's a Tiffany-style glass vase with decoration on an iridescent base. Can I say £200? 150 away? 150? £100 I've got. I'll take 110. 190 to my left. Is it 200? 200. -At £200. 210 now? 210. -One more bid, come on! -Normally at this point Jethro does a little dance. 280 on the phone. 290 on the second phone? 290. Is it 20? 320. 340, is it? < 520. 540? I can't believe it. 560. Is it 580? 580 I'm bid. -Whatever you do, do not adjust your sets! 750, we're done then. At 750. 780 seated. 800. 820 now? Yes, 820. 850? 820 in the room then. At 820 seated there. £820! -The hammer went down, £820! OK, Gina, Steve, you didn't think you would get that amount of money. -Not by a long way. Keep doing those car boot sales, especially those ones in Leeds. -It went for an awful lot of money. -People picked up on the Aurene word on the base of the glass. -And two collectors went for it. -A lovely Flog It moment! What a cracking auction we had in Lostwithiel and we've been embraced with wonderful Cornish hospitality! and Joy was over the moon with £720 for her watch. Time's up. See you next time on Flog It!